When we replaced the exterior windows and doors in our family room, I trimmed the door out with a fluted casing and a cornice made out of crown molding. 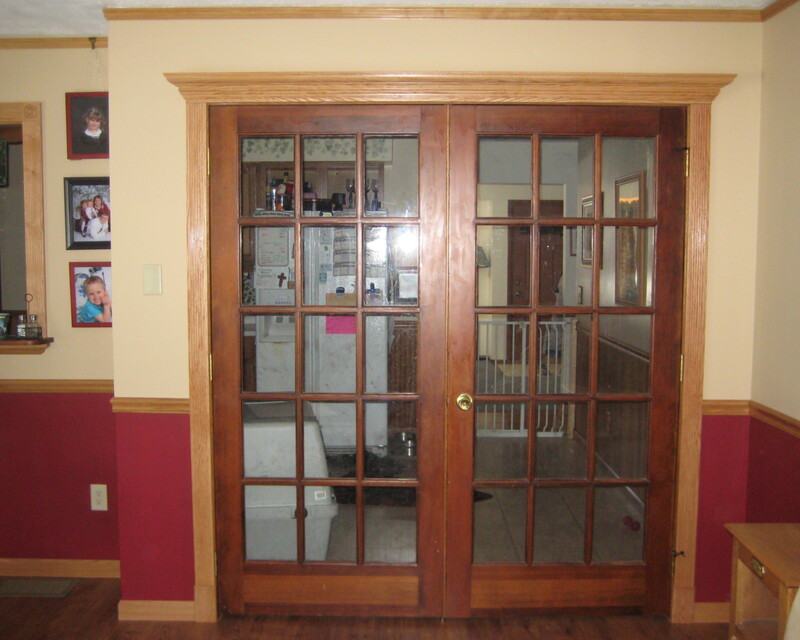 Now that we remodeled our family room, I wanted to trim out the double doors into the kitchen the same way. Wouldn’t you know it, the Big Orange Retail Giant no longer carried either the casing or the crown molding. Luckily I was able to find some crown molding that matched pretty well at Menards and I just swallowed my pride and used a different type of fluted casing. I’m the only one that’s going to notice that the original has 4 columns and the new stuff has 5 right? This isn’t about the casing though, it’s about making a cornice. Once I stained the red oak crown molding with Minwax Natural Oak stain and finished it with several coats of polycrylic, I let it sit until I finished putting up the rest of the trim in the room because I was chicken of screwing up a $40 piece of molding. 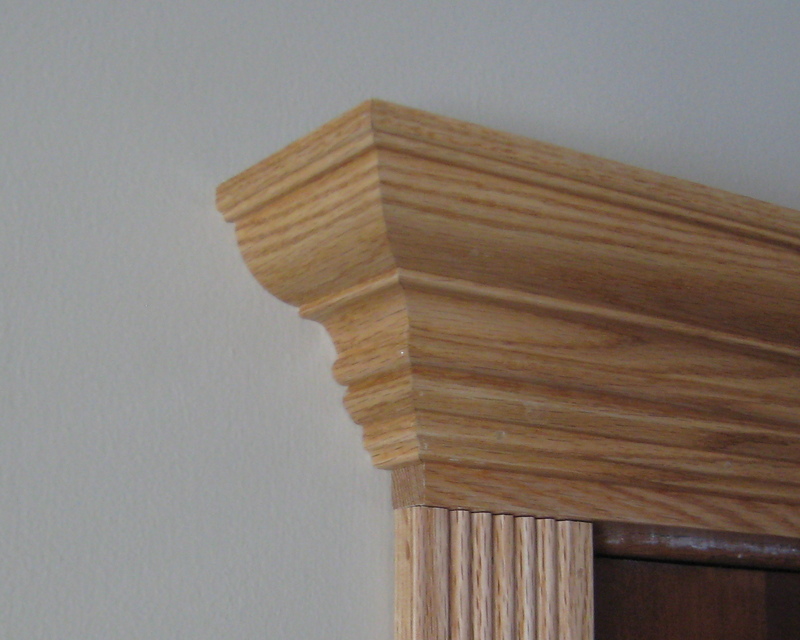 There’s two ways to cut crown molding, do a fancy compound miter cut or set up the saw to cut a 45° angle and flip the crown molding upside down and cut the opposite side. I decided to use the upside down and backwards method, because I didn’t know what the angle of the crown was, and setting one angle is easier than setting two. What they never tell you is that when you prop the molding up on your saw the molding isn’t cut at 90°, so if you have the molding flat against the base, it isn’t flat against the fence and vice-versa. You need to pick the edge you are going to nail into and make sure that’s the flat one. In this case I was nailing to a header board so I wanted the molding to be flat against the fence. 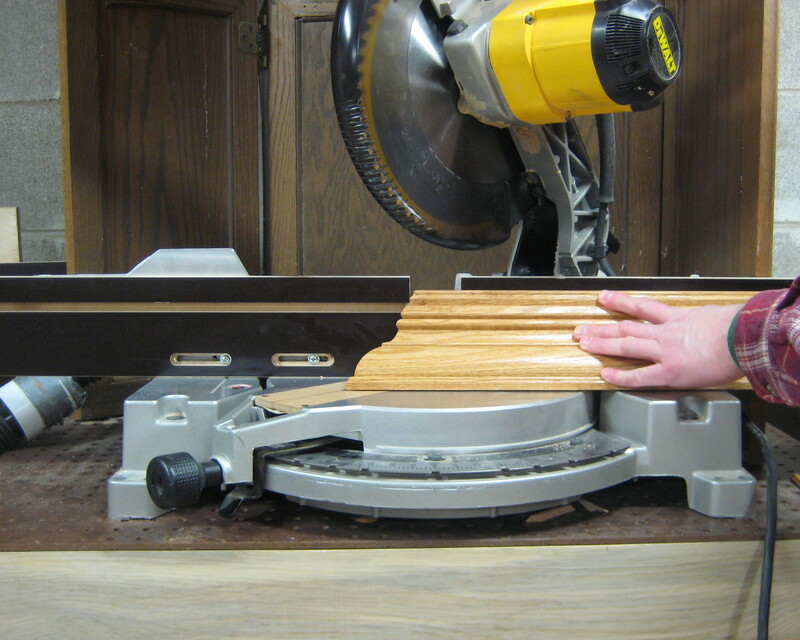 I cut one end of the molding leaving enough waste material to also cut a return piece. Then I glued that return piece in place and tacked it together with a pin nailer. Once the glue was dry I brought the partial cornice upstairs to measure for the other cut. This way I could use the hook the return around the header and get an accurate measurement. I cut the second end and a second return piece, glued and nailed them, and waited for about an hour. Then I had my wife help my hold up the cornice while I nailed it in place. I set the reveal using my handy 1/2″ brass setup bar, that pretty much matched the reveal of the original cornice. It feels good to be done. Well, you’re never really done… I need to refinish the doors to match the rest of the room, hang all the pictures back up using the new picture rail, touch up the paint, etc.